All those who accomplished a minimum of eight days of fasting, at the Harrow Leisure Centre stage in London being recognised by the community for their achievements. Today was the most difficult day of my whole fast, because I had to go on the longest journey. I had to travel four hours by train to Cardiff with my daughter Jaina to meet the University staff for the Open Day as she was keen to go and study there. It was a long and tiring journey and my weakness did not help. There was much walking to be done as well. But to my great fortune, when we arrived there, I bumped into two of my old Jain neighbours from Mombasa in Kenya who had brought their own daughters there! So I requested them if it would be possible to ride back to London in their car as I was fasting, and they immediately said - of course! That was so helpful to me, and I can only think that a higher force was helping me today. When I arrived back, there was a special ceremony in the community to congratulate all those who had accomplished their fast. The longest fast was by a dentist friend of mine called Kewal Shah who had done 16 days without any food, the last eight in total silence as well (no speaking, mauna). 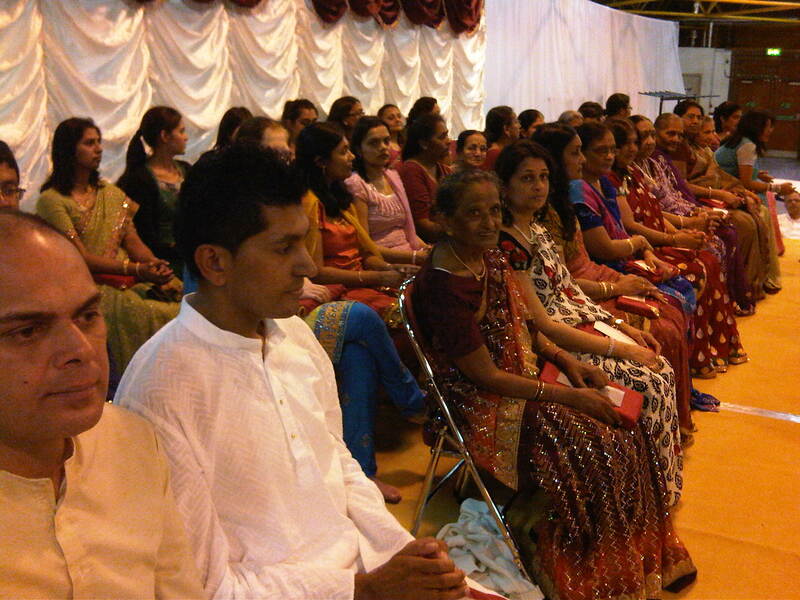 It was a very well organised and colourful ceremony, and in all there were about 30 of us on stage, just from the North-West London Oshwal community alone, and the majority of fasters were as always women. Each of us were given a gift of the Kalpasutra as a token of appreciation - it was a very encouraging event, an example of how festivals compensate for the pains of life, by adding colour and joy. TOMORROW IS THE GRAND FINALE OF THE FAST, THE DAY OF UNIVERSAL FORGIVENESS. IT IS THE MOST SACRED DAY IN THE CALENDAR OF THE JAINS, AND ONE WHICH COINCIDES WITH SEPTEMBER 11.